Catalaanse kunstenaar Josep Guinovart (1927- 2007). Guinovart geniet grote internationale erkenning en zijn werken zijn door vele musea verzameld. 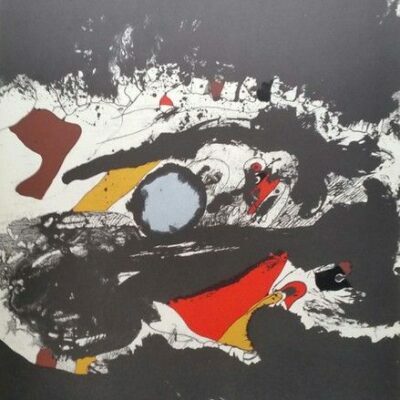 Josep Guinovart (March 20, 1927 in Barcelona – December 12, 2007 in Barcelona) was a Spanish Catalan painter most famous for his informalist or abstract expressionist work. In 1941, he began to work as a decorator. Three years later, he started his studies at the Escuela de Artes y Oficios de la Llotja (Art School of La Llotja) where he stayed until 1946. 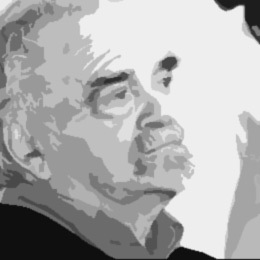 He first exhibited his work in 1948 in Galerías Syla in Barcelona. In 1951, he produced his first engravings entitled ‘Homage to Federico García Lorca’. Two years later, he was awarded a grant from the French Institute to study in Paris for nine months. Here he discovered the cubist works of Matisse and Picasso and travelled to Belgium, Holland and Germany. On his return to Barcelona and after a period working as an illustrator and set designer, around 1957 he began moving towards abstract art. His work is highly unconventional and usually on a large scale, using a wide range of materials, three-dimensional objects and organic substances such as eggshell, earth and straw. In 1962, he illustrated a book of poetry entitled ‘Posies’ by Joan Salvat-Papasseit for the Ariel Editorial. He won many accolades for his work throughout the 1970s and 80s. In 1994, a museum foundation dedicated to his art was inaugurated in Agramunt, his mother’s birthplace to which he always felt a special attachment. In 2006 he designed the winery Mas Blanch i Jové in La Pobla de Cérvoles (Lleida) and created The Artists’ Vineyard, a project intended to mix sculptures and other art works from different artists in the middle of a vineyard. The Artists’ Vineyard was inaugurated after his death in 2010 with the unveiling of his sculpture “The Countryside Organ”: a music instrument, 6 meters height, for the wind to sing the vines. This winery also displays the 10,5 meters work “In Vino Veritas” and other artist’s works. He died on 12 December 2007 at the age of 80, a few days after suffering a heart attack. Hieronder het werk van Josep Guinovart dat wij in onze collectie hebben.